This is a very awkward coffee cake recipe. The star here is the crunchy sugar-spice topping; very surprisingly, the actual "cake" is rather plain and actually tastes more bread-like. Unfortunately, the delicious topping practically falls off as soon as you pick a piece up to eat. 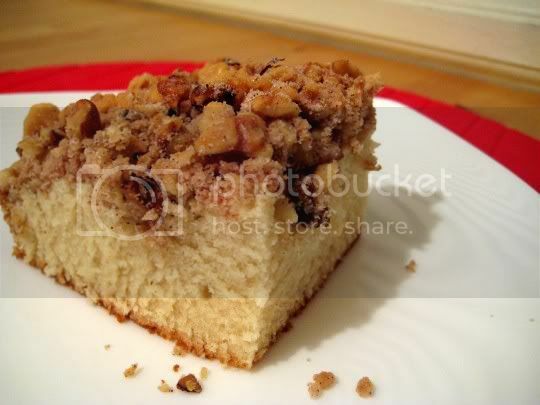 It's a mass of chopped walnuts (which give this otherwise plain cake some texture), sugar, cinnamon, and butter that will eventually coat your plate, so be careful as you eat this to get the full flavor for each bite. Meanwhile, the cake itself is extremely dense and has a slightly sweet, slightly salty flavor. I guess that would be a good contrast for the sweetness of the topping, but it's just not enough to make this a splendid coffee cake. Still, a good hunk of it would be great for breakfast with, of course, a nice strong cuppa joe. Make again? Probably not. I've tasted better coffee cakes...although this seemed to taste better after a day or two.